Type of wine: Light-to-medium-bodied white. 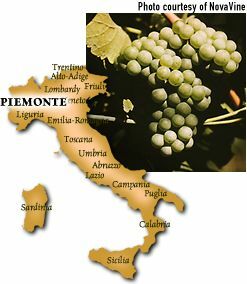 Origin: An ancient variety grown near Alba in Piemonte (northwest Italy). Recently saved from extinction by a few notable Barolo (Nebbiolo) producers. Arneis is sometimes referred to as Barolo Bianco although never labeled as such. Difficult to grow, "Arneis" in the regional dialect means "little rascal." It is often used as a blender to soften tannins in the red wines of the area, much as the French use Viognier in the Northern Rhone. Description: Delicate aromas and flavors of pears, with a hint of almonds. The grape seems to possess more acidity in California than in Italy, yielding a crisper wine with a more lingering finish. Aging: Arneis is best consumed within a year or two of the vintage. Best location: Warm-to-hot days with cool, fog-influenced nights help this variety retain acidity and delicate, sometimes fleeting, fruit aromas and flavors. FastFoodFacts: A charming aperitivo and sipping wine with ripe Bartlett pears, and a good companion for shellfish and lightly breaded, sauteed sole. Avoid cheeses and strongly herb-influenced dishes.